How David Byrne's and Brian Eno's latest collaboration, Everything that Happens will Happen Today, came to be. Click on Show Playlist, and you can listen to any other song on the album. Krom's Picks: Home, Everything that Happens, Life is Long, and One Fine Day. David Byrne's concert at Radio City Music Hall, February 28, 2009, was unbelievable. Kanye West cannot hold a candle to this consummate performer. 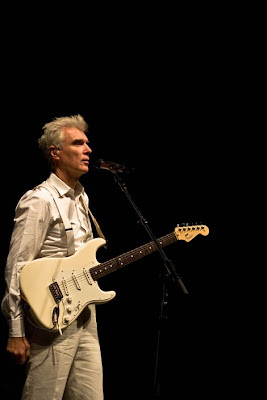 David Byrne is a real Renaissance man. Dance, Choreography, Lighting, Music, Composition - he knows how to take care of business. He is a man of the present with a deep knowledge of the past. He can recognize and respect the talent of others and put it to great use. I am talking about his choreographer, Noemie Lafrance and whomever he put in charge of his stage lighting. This was the most SuperFab concert I have ever had the pleasure to attend. David Byrne has set the bar on top of the world. Really great post. It looks and sounds amazing. I watched some of the vid on the website you linked me to. I want to go to Europe to see it. How'd you get to go? I bought tickets when I found out about the concert. You can go on his website to see his future concert dates.